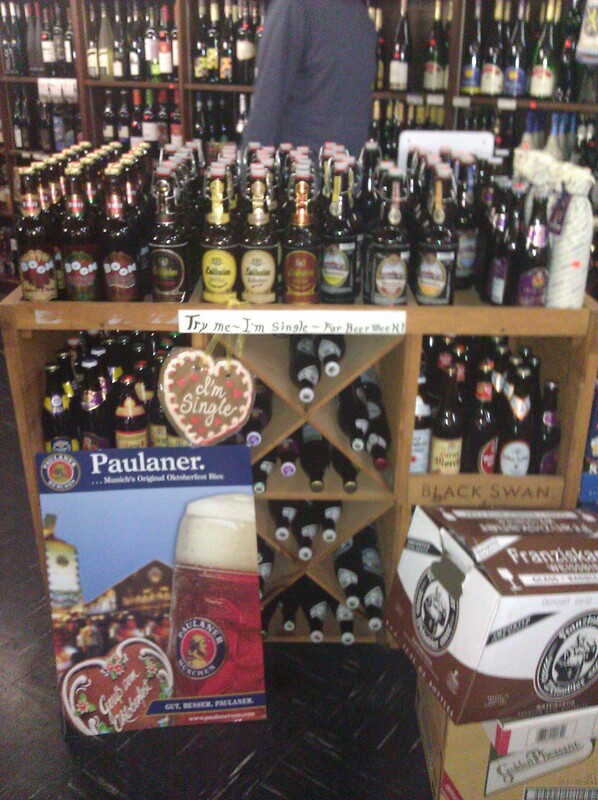 Hansa Import Haus has been in the greater Cleveland area, providing Germans and German food lovers with German food, wine and beer, for the past 51 years. It is located on Lorain Avenue, one block down from the West Side Market (across from Farkas Bakery and Touch Supper Club) and caddy-corner from St. Ignatius. Present day owner Boris Music, native of Slovenia, bought the store in 1980. He has been busy adding on a brewery and restaurant this summer, which I really hope is successful. I want to focus on the store for this particular post. I will review the restaurant later when it opens. 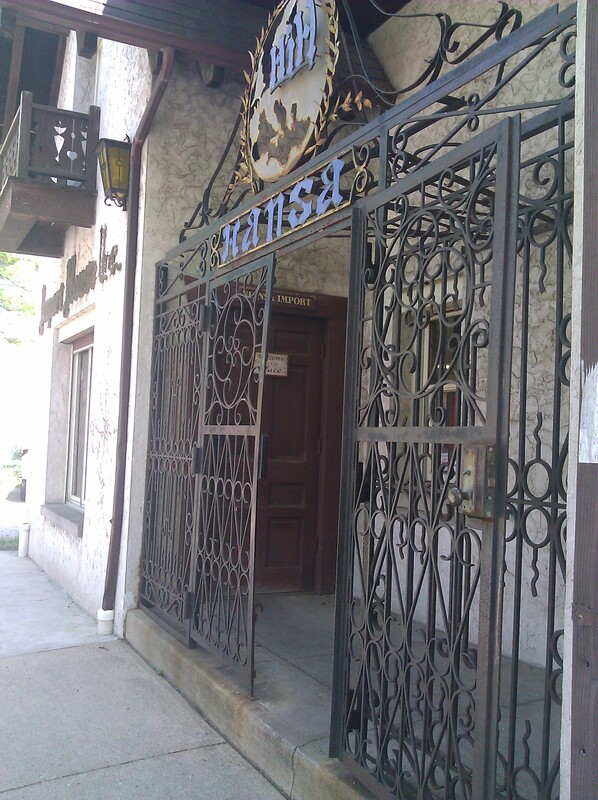 I have been shopping at Hansa Haus for the last thirteen years. It is my go-to place for German cold cuts, bread, cheese, chocolate, Paniermehl (bread crumbs for schnitzel), boil-in-bag dumplings and Knödel, jams, vinegars, coffee, and beer. 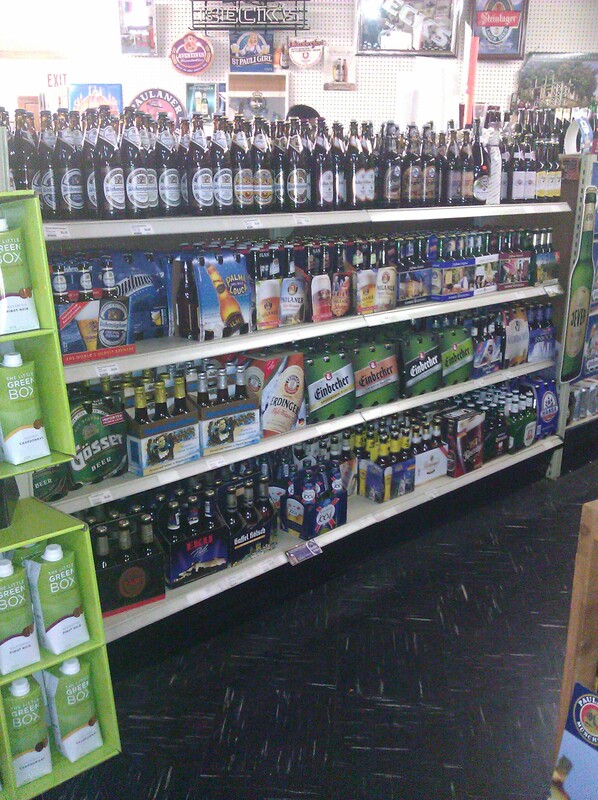 They stock beers from Germany, Austria and Belgium, as single bottles, six packs, cases or pony kegs. Some beers even come as gift packs with their own glasses. Whenever I have a party I have to buy a pony keg or two of my favorite German beers. The keg holds 5 liters of beer, and it is always a huge hit. My go-to keg is Reissdorf Kölsch, but they carry several different kinds of beers in the pony keg. 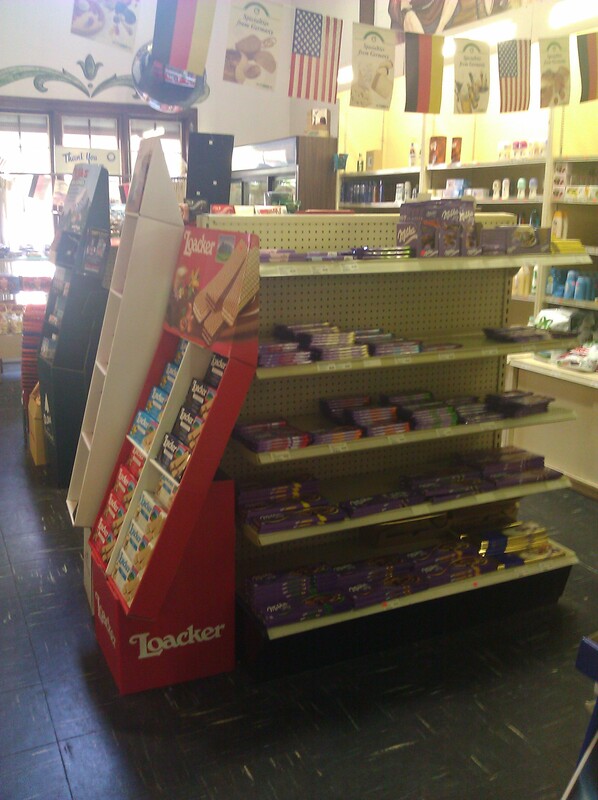 The chocolate supply for holidays like Easter and Christmas can’t be beat. I have been buying chocolate bunnies, Santas and Advent calendars here for my nieces (and myself). I highly recommend stopping there about a month before Christmas to stock up on the liquor-filled chocolates. I bring the Irish whiskey-filled or Grand Marnier-filled chocolates as hostess gifts over the holidays. My friend Susanne loves the Edele Tropfen in Nuss, which features fruit brandies or liquors in a crystallized sugar crust and hazelnut clusters covered in dark, milk or white chocolate. The refrigerated cases carry lots of different cold cuts, sausages, bratwursts, liverwursts, pates, cheeses, butters, Quark (a cross between creme fraiche and yogurt that is used in German cheesecakes and other recipes), herring, soda, juice, etc. For a real German treat, buy some Sauerrahm Butter (a butter made with sour cream), spread it on a slice of rye, Bauernschnitten (my personal favorite) or whole grain German bread, and put a thin layer of Gelbwurst, Jagdwurst, Krakauer, ham, liverwurst or Teewurst, Speck or Lachsschinken and some Emmentaler, Swiss or smoked Gouda. Mmmm, Lachsschinken… it’s unlike anything you’ve ever tasted. It is the center cut of a boneless loin of pork, rolled in a thin layer of fat to assure tenderness and moisture, cured and smoked. Tastes amazingly similar to smoked salmon (lox or Lachs). The Maggi Herb Butter is really good on boiled potatoes, corn on the cob and anything else that calls for a flavorful herbed butter. 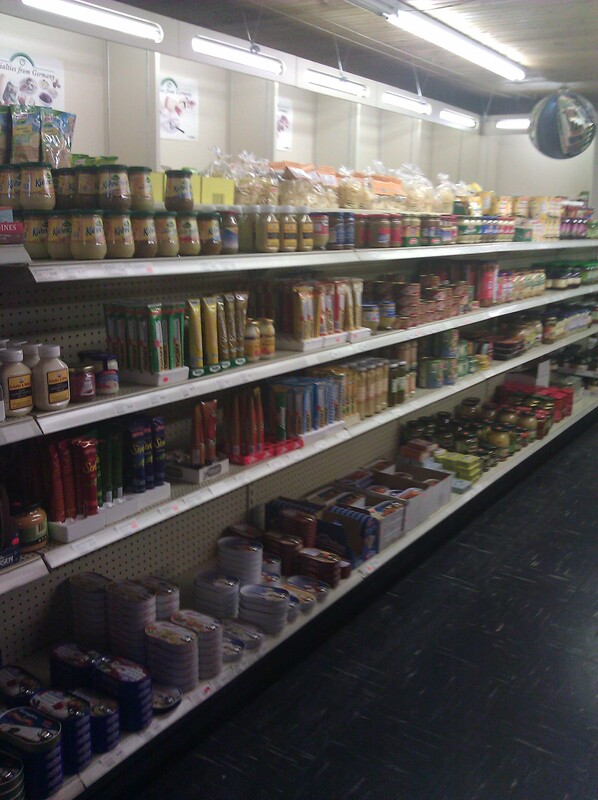 The grocery aisles carry all kinds of German mustards (from the sweet to the extra-spicy (Scharf)) as well as canned herring, sardines, noodles, pickled vegetables, sauerkrauts (I highly recommend the Mildessa Weinkraut!) and red cabbage kraut (Rotkohl), fruit juices (cherry and banana juices mixed together are AWESOME), jams and jellies, coffee, cookies, spices, and packaged Knorr and Maggi instant soups, sauces and noodles. The coffee choices are also extensive. You can choose from powdered cocoas, instant coffee, whole beans and ground and vacuum-packed coffee. My personal favorite is the Jacobs Krönung coffee in Mild, but the illy, Tchibo and Dallmayr brands are also good choices. If you need an instant coffee for a recipe I would buy one of these before reaching for the Folgers (shudder). German coffee just tastes smoother to me than other coffees. If you have questions do not be afraid to ask an employee. They know their food and have recommended some very good items to me in the past that I have been unaware of. And last but certainly not least, the item that I buy the most of here are the chocolates. I love the Ritter Sport and Milka chocolate bars. They come in a wide variety of flavor for every taste. My friend Jarod swears by Milka’s Trauben und Nuss (raisin and nut), while I love Milka’s milk chocolate, dark chocolate (Herb or Bitter) and vanilla pudding varieties. 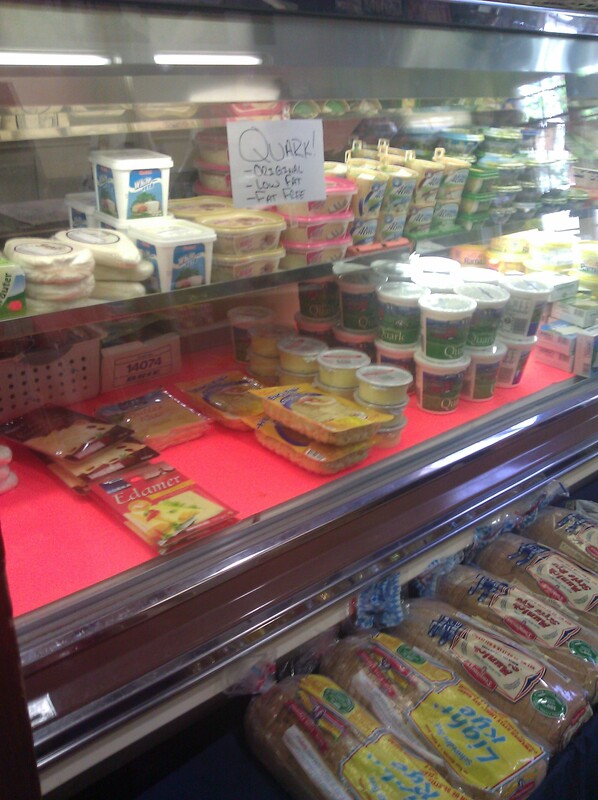 They even have yogurt, hazelnut, marzipan, and others that you may never have even considered. My favorite Ritter Sport is the cornflake one. Milka Tenders are better than any Ho-Ho you’ve ever eaten. Buy several and see which ones you prefer. Happy Shopping or as the Germans say, “Viel Spass beim Einkaufen“!